Insurance is a unique product. We all buy it with the hope we’ll never have to use it. We carry insurance for our homes, cars and families, but few of us think about insuring our investment portfolios. Many people are unaware that there are products designed to protect your investment portfolio’s value. Professional money managers call buying these insurance-type products a hedge. They hedge through a variety of sophisticated financial instruments that most of us wouldn’t or couldn’t consider. However, there are hedging alternatives for the average investor. The easiest way to help protect against a sharp decline in your portfolio’s value is to ensure it is diversified and balanced. Most investment advisors recommend this strategy but unfortunately limit their asset allocation to stocks, bonds and money market instruments. While this strategy is helpful during normal market conditions, it is not always an effective way to truly protect your portfolio – especially during a severe economic downturn. In order to reduce volatility and improve returns, portfolios should contain more than three asset classes. In total, there are seven asset classes: currency, equities, fixed income, commodities, real estate, precious metals and collectibles. If we eliminate commodities, due to the lack of simple investment vehicles, and collectibles, as they require specialized knowledge, we are left with five asset classes that are readily available. 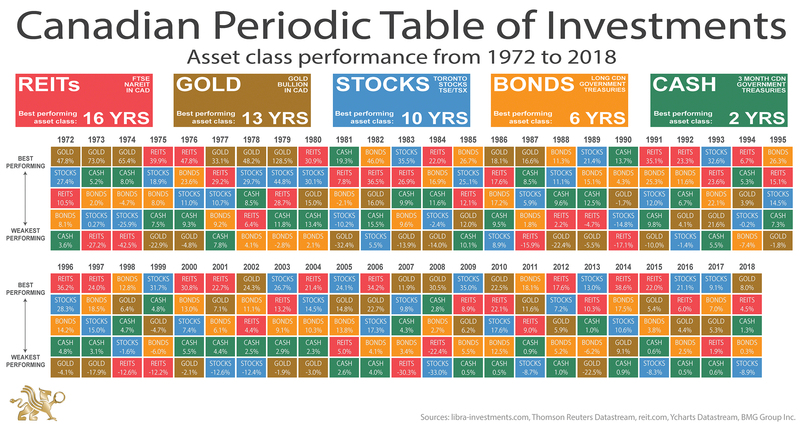 If we plot these asset classes over the past 40 years, real estate has been the top-performing asset class, followed by gold. 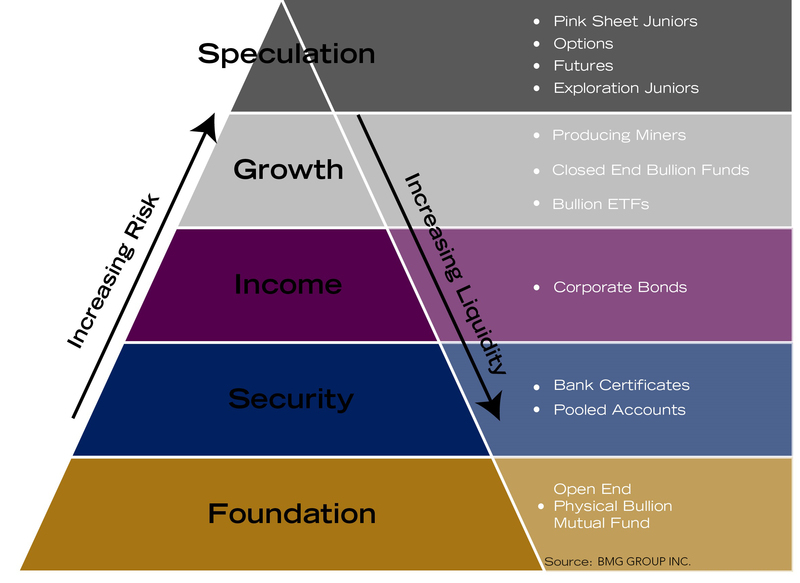 When it comes to gold, there are several investment vehicles available that have different risk/reward relationships. Physical bullion is the most secure and, as of January 2019, the Bank for International Settlements (BIS) has mandated that, for central banks and commercial banks, gold bullion held on an allocated basis is a zero risk asset equal to US dollars and US Treasuries. Unlike stocks and bonds, precious metals bullion is not anyone’s promise to pay, nor is it dependent on anyone for its value. 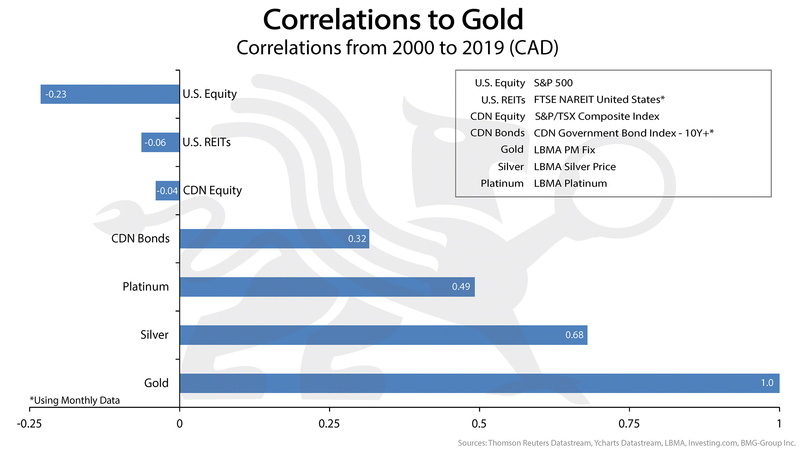 Gold and silver (and to a lesser degree, platinum) are also negatively correlated to other financial assets, particularly the US dollar. So, when the economy does poorly, the value of precious metals generally rises. As a result, precious metals act as portfolio insurance. Some advisors think that the way to benefiting from precious metals is through holding mining stocks. But investments like mining stocks, traditional precious metals mutual funds, and more complex futures contracts and options carry considerably more risk and volatility. If the economy does poorly, the value of these tends to decline by a greater percentage than the general equity markets even if the price of bullion is rising. The best way to hedge an investment portfolio is by holding an interest in physical, segregated and fully allocated bullion – real bars of gold, silver and platinum. This can offer a defensive position for the portfolio in difficult market conditions. BMG offers three funds – the BMG BullionFund, the BMG Gold BullionFund and the BMG Silver BullionFund. These open-end mutual fund trusts are a convenient and cost effective way of owning precious metals bullion inside registered plans, as well as direct investments. For high net worth investors and some institutions, BMG offers direct ownership of a variety of sizes of bullion products. Allocated storage is available in Canada, Hong Kong, Dubai, Singapore, Switzerland and Panama. Adding precious metals to an investment portfolio is a particularly timely discussion. We have never experienced a simultaneous triple bubble in stocks, bonds and real estate. All three are overvalued and due for a correction. Making matters even worse is the unprecedented amount of debt at all levels – government, corporate and individual. Many of the world’s leading financial experts predict a decline worse than 2008, and possibly worse than 1929. As a result, investors should consider rebalancing their portfolios and increasing or adding precious metals. What percentage you should hold is dependent on a number of factors, and for a full discussion, please review my recent article. Many ancient civilizations, including the Aztecs, Incas and Mayans, all recognized the value of precious metals and their ability to hold their purchasing power. Gold and other precious metals have been the ultimate store of wealth for over 3,000 years. While it may seem that many North American investors have forgotten these lessons, more and more Canadians are turning to precious metals like gold, silver and platinum to protect their savings and add some additional security to their investment portfolios.